Butterfly Baby Place: Such a Beautiful Picture!! Someone just posted this photo on my facebook fan page (which you should join, by the way) and I had to share it here. I've just started considering getting professional pictures for my shop and this really helps my decision. 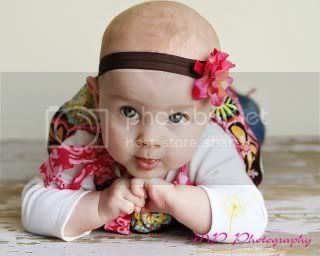 Of course, with this picture, people may want the adorable bundle of baby more than they want the dress. She's a little too cute for words, don't you think? But the dress is a nice backdrop at any rate. Your work is beautiful, Miranda! I can't wait to work with you!!!! !